Taste the healthy Cretan and Greek Mediterranean meat-free delicacies and our fine wine. You shall feel strong humanity, away from the stress of our daily life. You shall feel the warmth of Greek and Cretan Company. Your guide will show you the culture of Crete, the vegetarian principles and nutrition during the drives, tours, and all visits on the island. You shall find the true picture of Greece and Crete, not only in its magnificent monuments and tradition, but in its nature as well. You shall feel the magic of the clear skies, the smell of the aromatic plants, the full moon nights. Arrival the airport of Heraklion. Reception at the airport. Transportation to the hotel. Accommodation at fine 3*** hotel center of Heraklion city. Dinner at traditional restaurant with variety of Cretan vegetarian Mediterranean specialties. Today we visit the palace of Knossos. When visiting the island of Crete someone must see the ancient palace of Knossos, built 3.500 years ago. Combination of archaeological discoveries and food tasting: Start at 9 am. Visit takes 1 ½ hour. After the palace we drive back to the city and visit the Saturdays open farmers market. Visit will take an hour or so and ending the visit we walk the central market of the city taste special cheeses in a small cheese shop, and having break for lunch accompanied with ouzo (anise) with a variety of vegetarian dishes at one of the traditional Mezedopolion of the street. We end our walk after lunch visiting and taste the famous “loukoumades” Cretan style doughnuts sprinkled with honey and sesame. After breakfast, take a drive through the vineyards and small villages of the Heraklion region. Visit the 16th century monastery of Arkadi, and Margarites – a small village famous for producing ceramics. 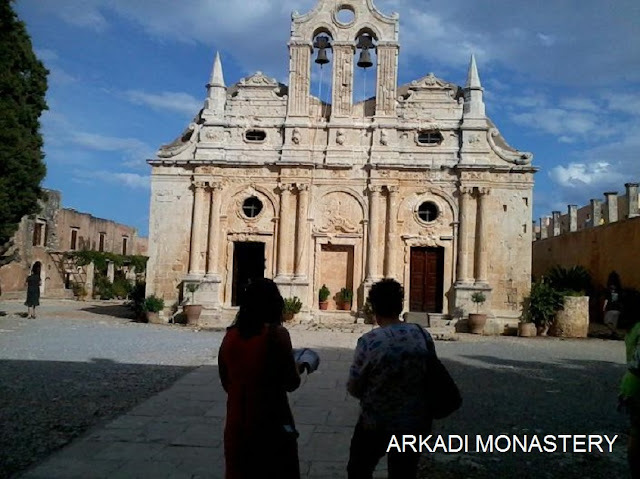 Next you’ll visit the city a Rethymnon a city seeped in history and an attractive place to wander through its narrow streets and marvel at Venetian and Turkish architecture that house its restaurants, cafes and shops. After browsing the shops and a coffee break where you can mingle with the locals, you’ll drive to the natural springs of Argyroupolis a site boasting attractive cascades and an idyllic setting for lunch where you’ll enjoy Cretan vegetable and cheese specialities. After lunch you’ll return to Heraklion. Dinner at traditional restaurant at the heart of the city. You’ll enjoy local vegetarian specialties along with some raki and local wine. We drive to a village near Heraklion. We visit small fine quality family wineries, depending the season we may have the chance join the way to make the Cretan snap (spirit) Raki or Tsikoudia drink Raki and home made chemical free unique wines and spend the day with the locals join them on their daily life and having lunch at a home tasting unique home made tastes. Dinner at local traditional restaurant in the centre of Heraklion with variety of vegetarian / vegan specialties. Combination of culture, food and history. First break at Gortys, ruined capital city of Roman province that included not only Crete but also much of North Africa. Including an impressive theatre, the Basilica of St. Titus the eponymous saint converted the island to Christianity and was the first bishop, the Odeon and the Law code. Continue driving to visit the palace of Phaestos the second most significant archaeological site of the Minoan civilization. Phaestos is located at the southern region of the prefecture of Heraklion in the valley of Messaras. The site of the ancient city is very impressive and the palace compound, although not as extensively restored as the compound of Knossos, offers a detailed insight of the everyday life of such a historically remote period. According to mythology the king of Phaestos was Rodamanthis brother of king Minos of Knossos, and superior judge of the underworld. Lunch will be in the fishing village of Kokkinos Pyrgos at the sea front restaurant of Kokkinos Pyrgos consisting of fresh sea food for the Pesco vegetarians and fresh local greens specialties. Back to Heraklion later in the afternoon. Dinner at local restaurant with variety of vegetarian local Mediterranean foods. Breakfast and drive to the airport of Heraklion for the flight back home. Cookies: On Crete, these cookies are traditionally made and served over the Christmas and New Year's holiday season. They are enjoyed at other times of year as well, but in December and January, they come together to create a fabulous collection of tastes and textures. Kalitsounia: These sweet cheese pastries are an Easter favourite on the island of Crete. Kouloura: These sweet breads are an Easter favourite as well on the island of Crete. Kourabiethes: Kourabiethes (also kourambiedes) are traditional celebration cookies, served at Christmas, New Year's, weddings, and baptisms. Toasted almond shortbread-type cookies topped with a generous coating of confectioner's sugar, they melt in the mouth. Melomakarouna: Melomakarona are a Christmas tradition in Greece (but enjoyed at other times of the year). All over Greece, kitchens will be filled with the wonderful smell of these spice cookies that will adorn tables, be given as hostess gifts, and eaten in huge quantities. Pastries: these cookies are traditionally made and served over the Easter holiday season. Pies: Crete is famous for its cuisine and mostly of its traditional “Kalitsounia”, which are small pies that can be filled with different fillings, such as cheese (tyropitakia) or greens and wild herbs (Hortopitakia). These unique delicacies are served across the entire island and are a very tasteful and healthy snack you can enjoy any time of the day, as an appetizer or light meal. Spoon Sweets: Spoon sweets are healthy confections, visually pleasing, distinctive, and extremely versatile. Offering them to guests is a wonderful tradition and a sign of "sweet" hospitality. Nowadays they are used as healthy spreads, in baked goods, and to top ice cream, cakes, and yogurt. Spoon sweets reflect the spirit of the Cretan and Greek hospitality. Spoon sweets are a traditional offering in Greek homes. Spoon sweets are fruits, preserved in syrup. They are commonly known as "spoon sweets" which translates to “sweet of the spoon.” due to the traditional way of serving the sweets on a well-filled teaspoon accompanied by cold water. In the old days, being a city child, I couldn’t imagine the charm of a diet that follows the passing of one season to the next. Later on, when I became involved in alternative tourism and having in me the love of cooking, I watched more carefully the various dishes of our local farming cuisine. I found that, above all, the most important thing is the “tasty hand”. It is true! No food, bread, vegetable, sweet, cookie or cake, produced by hand can be the same as another one. Every hand has a unique strength, warmth, power and skill. Behind the unbelievable inspiration and taste sensations of Cretan and Greek traditional cuisine there are many, many tasty hands. He began offering cooking holidays in response to guest’s request whilst working in travel and has run the holidays for a number of years. George’s interest and expertise in vegetarian and vegan cuisine came in response to some guest’s comments that Cretan and Greek food is heavily meat focused. George’s style is friendly, informal, and relaxed and cooking is often accompanied by a glass of wine or raki. He thinks cooking should be a fun activity to be shared with friends and there are no strict rules to his cooking. He believes the freshness of the ingredients make the dishes and uses only local ingredients. George is passionate about the island of Crete and so as well as taking you on a culinary journey to discover the island’s cuisine, it will also be a cultural one. In Crete, a meal is not only a celebration but also a culmination of various events. Enjoy culinary explorations that blend all the secrets particular of the region of Crete and let you enjoy and learn about them first-hand alongside the locals. Going from one region of Crete to another changes not only what you eat, but how you eat it, how it’s prepared and what accompanies it. Each region is a mystery unto itself. Immerse yourself in the fantastic flavours and mouth-watering smells of regional Crete. Comfort and luxurious hospitality in the heart of the city. Hotel Olympic has 73 spacious and comfortable rooms, with double glazing for optimal sound isolation, central heating and separate air-condition, as well as an integrated system of fire-protection and fire-extinction that covers the hotel throughout. Furnished with hand-made oak furniture and decorated with particular tastefulness rooms, Hotel Olympic offers all modern conveniences and services. The experienced and friendly staff will satisfy the needs and wishes of our guests who are in town either on business or to enjoy their holidays. The hotel offers single, double and triple rooms (with a sofa bed) as well as rooms for guests with disabilities. Furthermore, joined rooms are available, specially designed for families. There are rooms with a balcony or a veranda. Small pets are allowed (the guest should previously notify the hotel regarding this). For many Greeks (especially in the countryside and islands), five days a week their meal is vegetarian or vegan. Yes, Greeks are meat and dairy eaters, but because such a large percentage of our diet consists of pulses, vegetables, greens and fruits, a vegan or vegetarian visitor will not have any difficulty in finding a huge variety of vegetarian food all over Greece. You don’t have to apologize or explain why you don’t eat meat. Custom dates available for a minimum of 4 people or price for 4 people. Entrance fees are extra. For more information ask your questions directly to Porto Club Travel Services who will be happy to assist you. Simply click on the Contact Organizer button to send a message. Jones Morris 4 Οκτωβρίου 2017 - 9:29 π.μ.